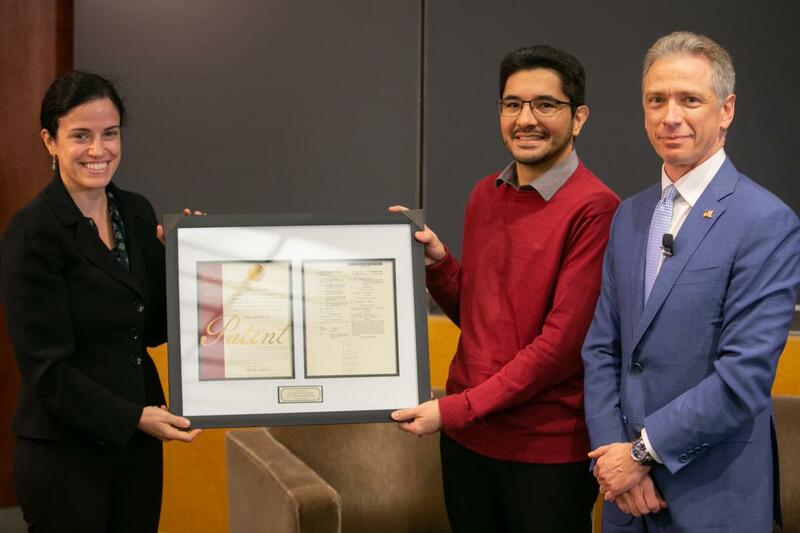 On November 29th, Hermes Kamimura, a post-doctoral research scientist, and Professor Elisa Konofagou were awarded a patent by Andrei Iancu, the Director of the US Patent and Trademark Office and Undersecretary of Commerce. Director Iancu, who gave a talk on campus co-hosted by Columbia Technology Ventures, Columbia Engineering, Columbia Law School, Columbia Business School, and the School of International and Public Affairs, kicked off the event by presenting the recently awarded patent for non-invasive brain simulation using ultrasound. The patent presents a novel non-invasive system and methodology for neuromodulation using focused ultrasound (FUS). FUS can achieve higher target specificity than Transcranial Magnetic Stimulation (TMS), and it is a completely noninvasive alternative to Deep Brain Stimulation (DBS) that requires electrode implantation or optogenetics that involves genetic modification of neurons. It was demonstrated through motor control of limb and eyeball, as well as pupillary dilation in mice, that the system is capable of stimulating selectively cortical and subcortical brain structures in the order of millimeters. This technique has the potential to be used in a wide variety of clinical applications, such as to treat neuropathic pain, Parkinson’s disease, epilepsy, depression, obsessive-compulsive disorder, among other disorders or to analyze various conditions and perform brain mapping.